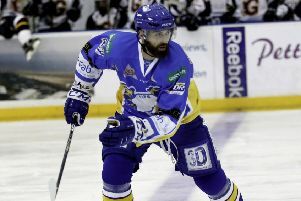 Fife Flyers have run into major travel problems getting back from Belfast to play their scheduled Sunday night game. The ice hockey team was meant to sail after last night’s 2-1 defeat to Belfast Giants, but the ferry was cancelled, forcing an extra night in the city. They were scheduled to depart at 11.30am this morning, but that ferry has now been cancelled. The original 6.30pm face-off had been rescheduled for 7.30pm to allow the team time to make the long sea and road journey, arriving straight at the rink around 5.00pm. Those timings were based on the 11.30 am ferry sailing. The next boat isn’t scheduled to leave Belfast until 3.30pm with an arrival time into Cairnryan just before 6.00pm. The boats IS good to sail as scheduled as it stands, but Flyers would still have a long bus journey from south west Scotland to the rink. That could potentially mean a start time of anywhere from 8.30pm/9.00pm onwards with minimal time for the team to kit up and warm up. There IS precedent for late night hockey in Fife. Old-time fans will recall the famous occasion in the 1980s when a vital Flyers’ game clashed with a smoker in the curling bar. The curlers refused to re-schedule, so Fife didn’t hit the ice until very late at night, with the game finishing well past midnight. A huge crowd turned out to support the team, and voice its disapproval at the decision. The club is exploring all options to get the team, and its kit off the island, as quickly as possible, but their options are limited. Fans travelling with the club have been told to wait for further updates as they prepare to check out of their hotel at 11.00am.